Before my real work day started, I ran some errands, which these days often includes a quick stop into my local Goodwill. There were lots of new things since I’d last been in, including nice pottery from Portugal, but it was priced too high. In fact, everything I found in the first 15 minutes was too pricey. 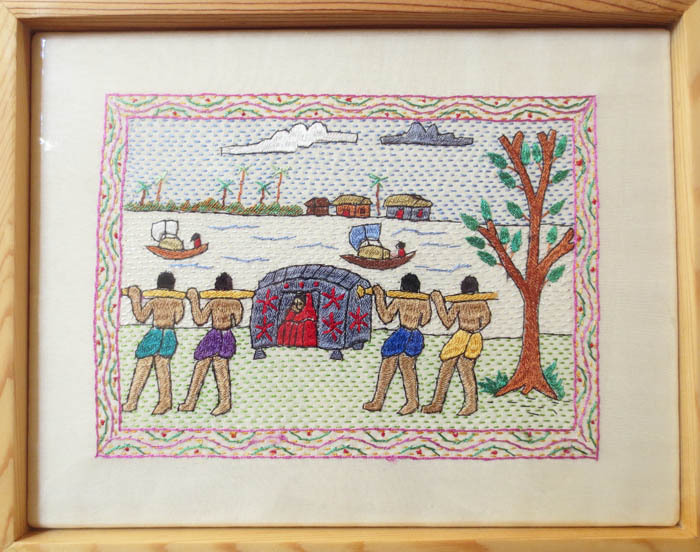 Finally I saw this intriguing little framed, hand-embroidered scene for a reasonable price. Into the basket it went. Turns out the company, Aarong in Bangladesh, is a good one that helps folks make a decent living. Second, I picked up a little figurine of a reclining baby made of porcelain bisque. I immediately felt this piece had age. Real age. Maybe it was the style of the hand-painted face. Even with no maker’s marks, it looked European to me. 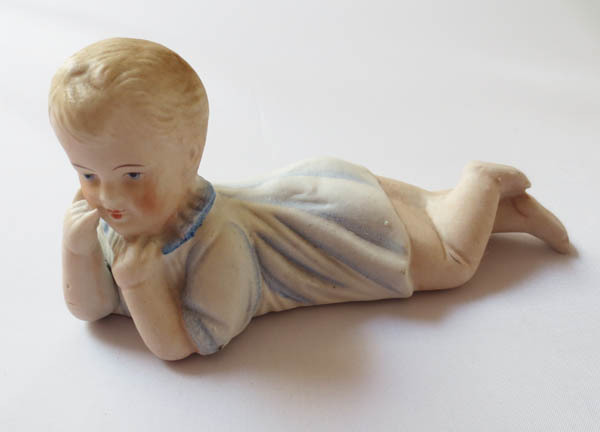 Got home and within 10 minutes online discovered that it’s a piano baby figurine, likely from Germany in the 1910s. Cool, right? 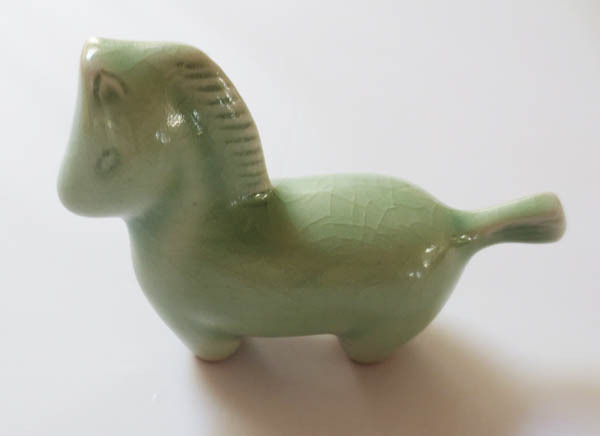 Next, I spotted the perfect little 3.5″ high celadon horse. Probably not worth a tuppence, but for $1.79, I took the chance! Haven’t found any details on this yet. 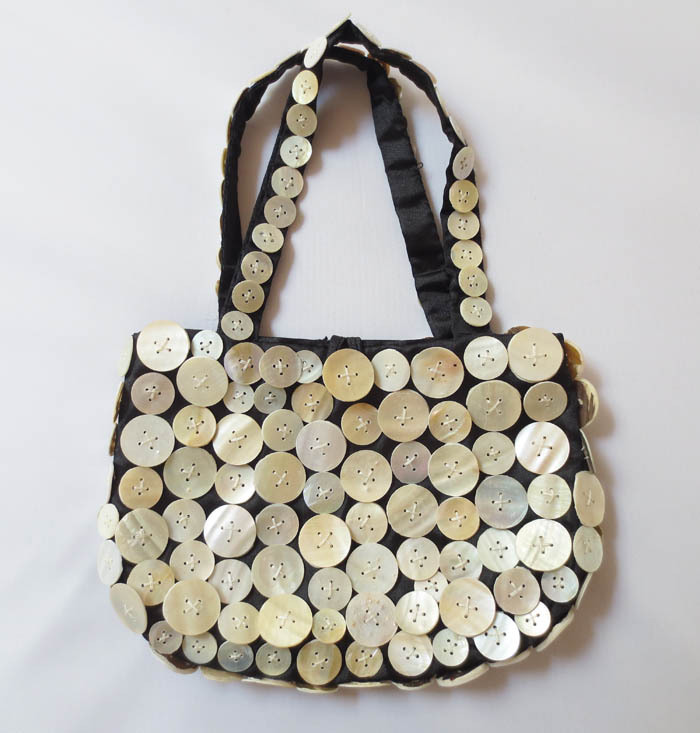 And lastly, I found a small black satin evening purse covered in mother-of-pearl buttons. Reminded me the zany pearly kings and queens of England. There was no tag in it, but after some research, discovered that it is likely made by Shiraleah. It looks unused and is big enough for a cell phone, lipstick and wallet! All in all, a good Groundhog Day haul. Three of the things I bought had just been put out the day before! Which is always a good reminder that you really need to go often to get the best stuff. Hoping to get these in my store soon.